LOVE!! Thank you so much. Thank you for doing this each week! I love it. Please continue to share. Thank you so much these meal plans are saving my life ! Thank you so so much !!! I am so excited to try your weekly meal plans! they are laid out so nicely and organized! i used to be on weight watchers but not any more, i do not like that they change the plan every 2 years. so i am sticking with counting calories. I am so excited to finally start feeding my family healthy food! please keep these up! my picky eating husband and I love your meal plans and thank you. I have a hard time with meal planning and when I don’t we end up with junk dinners and this just makes it so easy. Since we started we have both dropped weight and have been feeling so much better! Your one pot Spaghetti and meat sauce replaced my normal pasta recipe and it’s easy to add veggies or sub in FF ground turkey instead to lower the FP even further!!!! These plans are amazing! I feed a family of 7 – 3 of which are “picky” – so the flexibility your plans give me are much appreciated!! I just started on your website, so I hope that you continue to put out free meal plans. I know it is a time consuming task, how awesome are you to do it for free!?!? !Thank you!!!! I’ve tried to email the weekly meal plan to myself several times. It says it’s sent but I don’t receive it. I also subscribed but I don’t know if that worked either!! I didn’t get any kind of confirmation email. I just re-entered you Dorothy, let me know if you start getting emails! I love that you created meal plans with shopping lists! Is there anyway to just get the dinners and the shopping lists for dinners but not the rest of the days meals? Thank you for the meal plans, please don’t stop them ever! I just found your meal plans yesterday and made the italian sausage pasta for dindin. My husband loved it. 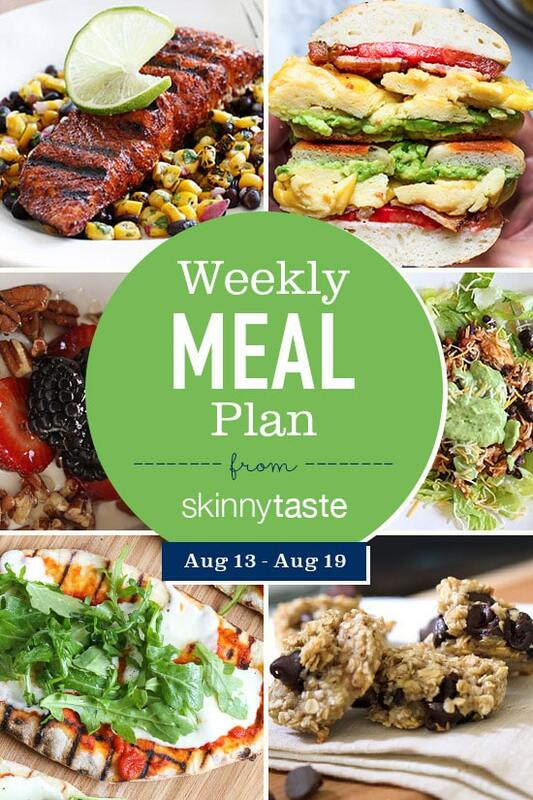 Thanks so much for sharing these weekly meal plans. They are a life saver! Looking forward to next week’s plan! Your meal plans are my salvation! Please keep them going! Thanks so much for putting these meals plans together; it makes life so much easier when I already know what’s for dinner (and breakfast and lunch!) The addition of a pdf menu and the shopping list is just icing on the cake! Would you consider including one dessert that could be divided up throughout the week? The banana/oats/choc chips could work and I am going to make those for next week desserts. But if you could intentionally include it that would be amazing. Thank you! These meal plans have given me control and yumminess! This is the first week I have used the Meal Plan and I LOVE it! Exactly what I was looking for. I don’t have to think about what I will be eating which is wonderful for me with a night job and 3 kids, one of which is fairly new. After having the meatballs the first day, I was already looking forward to lunch the next day. Super delicious and convenient! Bonus: I have been able to break through the plateau I was stuck at and have already lost a bit of weight AND it doesn’t affect my milk supply! This week has been great and I am excited to see what the next ones will be. Thank you!! Gina thank you for all the hard work you do to put these recipes together. I love the freestyle points and the meal prep. I was running out of ideas this week and you posted this! Love all the recipes this week. The meal prep is such a big help for those of us doing weight watchers. I always share your recipes on Facebook. Looking forward to your new cookbook! Thank you! I’m so happy to hear, I really appreciate that. Please continue the meal plans! I used to do all my own planning (typically using your recipes), but now I just don’t have the time, so I let you do the planning and list-making for me. Thank you for putting these together! I am new to this meal planning. What day am I supposed to do the shopping? Do I cook all recipes the same day or at each meal? I have been enjoying your recipes for years. I haven’t strictly following the meal plan since there are only two of us in the house, and we usually eat left-overs on the second night. Last night, we finished the Grilled Bourbon Chicken that we cooked Sunday evening. My husband declares that the chicken is the best he has ever eaten. I always know that I can find just the right recipe for the ingredients I have on hand by searching Skinnytaste. Please continue posting the meal plans and wonderful, tasty and healthy recipes. Thank you so much! My Wife joined WW and as I do all the cooking…I guess i’m along for the ride. Your weekly guide has helped me immensely! On the Greek meatballs if I just wanted to use bread crumbs instead of buying a loaf of bread (cause it’s juat me and I’ll never get through it) how much should I use in addition to what it already calls for? I have used a number of your recipes for a few years now and am using your meal plan for this week. So far, my family is enjoying everything and I really appreciate the efforts you have put into planning these! This has saved me so much time this week, thank you!!! We are going to follow this weeks plan. Its out first time following it exactly. Very excited. =) Thank you for putting it together. Please continue with your meal plans. The recipes are amazing and it’s so easy to plan my week. Just found your site and tried subscribing to the newsletter, but wouldn’t accept either of my email addresses. Said it’s the wrong format and to choose another. Never had this problem before? Email me, I can help you subscribe. I just returned to WW for the 3rd time and someone at a meeting suggested your blog, books, etc. I am in love! I tried the Paleo and AIP thing for a while due to stomach issues which I finally healed but I still have to watch it and eat GOOD food. Your plans fit the bill. I also just bought your cookbook as a present to myself, turned 57, have 6 more lbs. to lose and want to get in the best shape of my life before the big 6-OH!! Keep ’em comin’!! First, I love your recipes and the meal plans!!! Question on the Chicken Milanese recipe: it says to use 24 oz chicken for 6 servings equaling 4 oz servings, but the Nutritional Info says the serving size is 3 oz. Which is correct? Love your plans! Have been using them for 5 weeks now and cook everything on them. Your recipes are amazing and whenever I cook for others – I receive the most wonderful compliments! I want to thank you for posting weekly meal plans. I usually go to Aldi’s first to buy what I can and then to the grocery store. Your plans are easy to follow and my family loves the week. They know ahead of time what’s for dinner. Please keep sharing meal plans. It really makes a difference in the week. Gina, I love your weekly schedules and they totally help me plan my week. Please continue to publish them!! It is my favorite to follow! All the best! Every week since you started. Love this! Please don’t ever stop sharing the meal plans! Love your meal plans! Thank you for doing them! 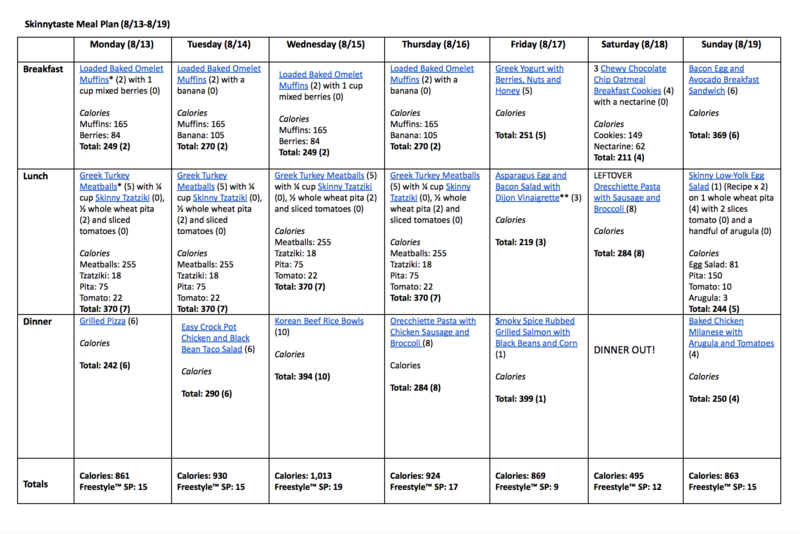 I’m excited to try this week’s meal plan. Last week it worked great for my family. Shopping was easy with the list and EVERYONE loved the recipes! They were delicious and easy to make. I love that they are filled with healthy ingredients. For my active, athletic sons, I grilled some chicken breasts on Sunday and added a piece of chicken to some of the meals (such as the Zucchini Boats) to make sure they got enough protein. For me, all of the meals were very satisfying. I also lost 3 lbs. this week! Thank you for making these meal plans. I plan on continuing to use them. I am so glad to hear!! Thank you, thank you!! I always cook your entire plan. Please continue to share! !